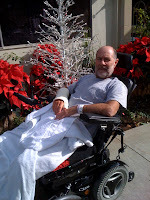 Another day at re-hab, Russ is getting used to the routine and settling in. Of course he's making friends with everyone and he's working really hard at keeping his muscles pumped. When he found out that in 2 weeks laying in the hospital you loose 20% of your muscle mass, he was shocked. So for now until he can bear weight on his legs (pelvis) (that's not until February) the therapists are trying to strengthen his muscles without hindering his recovery. Tomorrow Sunday he gets the day off for good behaviour. I'll be trying to keep up with him in his hot rod. Maybe we'll see you there. So Great to see Russ Smile! Thank You for sharing you good new with your church family who lift your family up daily.